An interview with UCLA's Kevon Looney, featuring footage from his pre-draft workouts in Las Angeles. The 10th best prospect in the 2014 high school class according to the RSCI, Kevon Looney got off to an extremely strong start for UCLA. He cooled off significant as the year moved on, but still had a good freshman season overall, helping the Bruins make the NCAA Tournament's Sweet Sixteen, where they fell to Gonzaga. On a team with little to no depth, Looney was forced to shoulder all the minutes and touches he could handle right off the bat, which is any freshman prospect's dream scenario, but did expose his limitations to a certain degree. Looney has good size for a power forward, measured at 6-9 ½ in shoes, with a huge 7-3 wingspan by USA Basketball in 2013. He is not an exceptional athlete, as he possesses just average quickness and explosiveness, and also does not have a great frame by NBA standards, with high, narrow hips that give him somewhat of an awkward build. Most of Looney's offense at the moment derives via hustle plays, with the biggest share of his production coming on the offensive glass according to Synergy Sports Technology, and spot-ups, cuts, pick and roll finishes and transition plays making up the rest of his profile. Looney has a great knack for crashing the offensive glass, showing terrific instincts and timing going out of his area and pursuing loose balls using his superior wingspan, often without even jumping. He shows a very nice competitive spirit here, boxing out well and not being afraid to mix things up with older and stronger players than him. His 4.2 offensive rebounds per-40 minutes ranks 11th best among Top-100 prospects. He's not quite as prolific on the defensive glass, ranking 17th among Top-100 prospects, but should be able to hold his own here as his frame continues to fill out. He likes to take the ball off the defensive glass and ignite the fast-break on his own at times, showing solid ball-handling ability in the open court. Looney also shows potential as a floor-spacer, knocking down 22 of his 53 attempts (41.5%) from beyond the arc on the season in the 36 games he played in. The sample size leaves something to be desired here, particularly when you consider the fact that he shot just 63% from the free throw line, but his mechanics are solid and he appears to fairly consistent when shooting with his feet set. When defenses close out too aggressively, Looney has the ability to attack closeouts and make his way to the basket in a straight line, although he does not have any type of pull-up jumper at this stage due to his rudimentary footwork and slow release, making just 5 of his 21 off the dribble attempts on the season. Defensively, Looney shows nice versatility, often playing at the top of UCLA's zone and covering ground nicely on the perimeter, contesting shots impressively with his long reach. His lateral quickness is solid, and he's able to get in a low stance, which aids him in keeping smaller players in front of him. He's much more limited as a post-defender at this stage, where his average frame and lack of strength is not a good combination. While he's clearly a competitive player, he can get pushed around relatively easily at this stage, which may be an issue for him in the NBA early on in his career. Looney tends to tire fairly easily and often looks fatigued as the games move on, grabbing onto his shorts and really struggling with his effort and awareness. This was increasingly an issue as the year moved on, which may explain why his production took as much of a nose-dive as it did. It's not clear if this was due to a lack of conditioning or something more deeply-rooted. As a scorer, Looney just wasn't all that prolific this year, especially against better competition, where he simply struggled to make his presence felt in the half-court, scoring 13.9 points per-40 on a paltry 43% from 2-point range against BCS teams over .500. Overall, his 14.4 points per-40 minutes pace adjusted ranks 74th among the 82 college players currently in our Top-100 prospect rankings, and he wasn't very efficient to compensate for that, ranking 70th in true shooting percentage. Looney doesn't possess any type of post-game, lacking the strength or footwork needed to score with his back to the basket, as he hit just 8 of his 32 attempts on the year. He is just an average ball-handler when forced to create a shot for himself as well, struggling to get by power forwards due to his underwhelming first step. Most alarming is his inability to finish plays around the basket, as he converted just 52% of his shots inside the paint this year in the half-court, which is fairly poor for someone with his size and length. His lack of quickness and explosiveness limits his upside as far as the NBA is concerned, as he may be relegated to somewhat of a one-dimensional role in turn. Looney is still very young, only turning 19 in February, which means he still has plenty of time to develop as a prospect. He has a nice feel for the game, posting a positive assist to turnover ratio, and his length, rebounding prowess and developing shooting range gives him some nice things to fall back on. Some of his limitations are fairly worrying, though, and could certainly limit his potential to develop into a starting caliber player in today's hyper-athletic NBA, so continuing to develop his perimeter game and trying to maximize his frame and explosiveness will be imperative moving forward. Outlook: Undersized power forward with terrific energy and toughness. Selfless teammate who will help a college team win plenty of games. Will need to continue to fill out his frame and expand his offensive game to improve his NBA prospects and not be labeled as strictly a garbage man type role player. 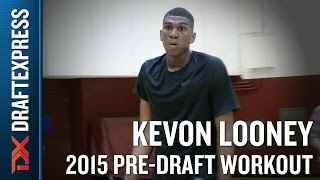 Top-10 2014 high school recruit Kevon Looney talking with Jonathan Givony of DraftExpress about why he decided to attend the event, what his background is and how he got noticed, what kind of player he is, his family, his recruiting, and his plans for the NBA. From the 2013 adidas Nations.